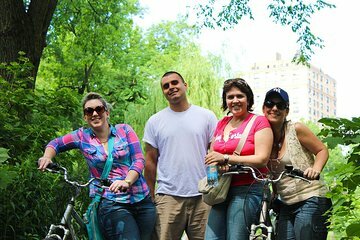 Pedal to Central Park’s scenic paths and landmarks on a 2-hour, small-group bike tour with an experienced guide. Enjoy a leisurely pace as you follow your guide through the park, and learn about the history of New York City’s most famous green space. See a sprawling collection of statues and public art, visit historic buildings, then get off your bike to explore a few iconic destinations on foot. Stop for filming sites, manicured gardens and hidden waterfalls, and enjoy the personal experience of a small-group tour. Die Tour hat uns gefallen, der Tour-Guide sprach gutes Englisch und führte uns durch den Central Park. Allerdings mussten wir zu Beginn der Tour im Fahrradladen etwas warten, da wir anscheinend trotz Vorabbuchung nicht erwartet wurden. Ebenfalls haben wir den in der Tour-Beschreibung versprochenen nördlichen Teil des Central-parks, sowie die versteckten Wasserfälle North Woods und die verborgenen Geheimnisse vermisst. Es war eine normale Tour aber nichts Besonderes. I enjoyed being outside, riding my bike and having someone who knew the route. I wanted more information, some stories, something added. I did not feel that it was worth the extra money for this guide as he did not add to the bike tour as I thought he would. I would not recommend this tour. You can get a map and do it on your own for half the price if you want to just ride and see the park without any added information. Our guides seemed clueless, could barely be heard or understood. Group members got lost and we wasted our time and money. Horrible experience. I did this rating already. The best tour is NYC. Loved it. The owner was also really helpful. Highly recommended!